When I first heard of Camelina oil, also known as “false flax” because of its visual similarity to regular flax, I was intrigued. The seed oil of Camelina contains an exceptional amount (up to 45 per cent) of omega-3 fatty acids, as well as a unique antioxidant complex making the oil very stable and resistant to heat and rancidity. Unlike flax oil or any other omega-3 oil, Camelina oil can be used not only as a well-balanced omega-3 supplement, but also as a health-promoting everyday cooking oil since heat does not destroy it’s chemical makeup and health benefits. Omega-3 fatty acids, essential to our health, have been almost entirely forced out of the everyday North American diet by the commercialization of our food supply. In recent years, extensive research and numerous clinical studies have confirmed that omega-3 fats are involved in vital physiological processes in our bodies, and that not consuming enough may cause or aggravate many serious medical problems and conditions, including atherosclerosis, hypertension, arthritis, irritable bowel syndrome, dermatitis, asthma, ADHD, and even cancer. Therefore, adding a good source of omega-3 fatty acids to your diet is believed to be a good way of improving or preventing these conditions. The question of what constitutes the best source of omega-3 supplementation is, however, still being debated. While I have always recommended fish oil and/or flax oil as dietary supplements for omega-3 fats, some people do not like taking fish oil because of the taste or the concern of the purity of the product; The problems with flax oil are that it cannot be used for cooking, it becomes rancid after a few weeks and it doesn’t taste all that good. Camelina oil seems to be the answer to all these issues, so why not give it a try and see if you like it? Some people describe the taste as “nutty” and others as “earthy” but when I opened my first bottle, I have to admit I was disappointed because it just smelled…..strange. But I figured I’d give it a shot anyway so the first thing I made with it was a chicken and vegetable stir-fry. I’m so glad I didn’t base my opinion on that first smell, because the stir-fry not only smelled delicious, it tasted great as well. With further experimentation, I learned that Camelina oil is excellent in any type of vegetable stir fry, grilled veggies, salad, chicken or meat but I would personally avoid it for some fish and any sweet dishes or baked goods. How does Camelina oil stack up to other oils I recommend for cooking and/or every day use, namely cold-pressed olive oil, coconut oil or grapeseed oil? Camelina oil has the most balanced fatty acid ratio between Omega 3, Omega 6, Omega 9 and Saturated Fats. With this favourable balance, the health benefits include lowered cholesterol, lowered blood pressure and anti-inflammatory properties. The brand I use is by three farmers, a Canadian company based in Saskatchewan. Their oils are GMO-free, Certified OU Kosher, and available in regular or flavored varieties. 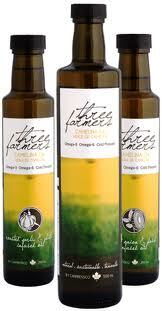 To learn more about three farmers as well as more details about Camelina oil in general, CLICK HERE. Would love to hear your comments and feedback if you have tried this versatile oil!